Donald Trump will be the only world leader to deny climate change. 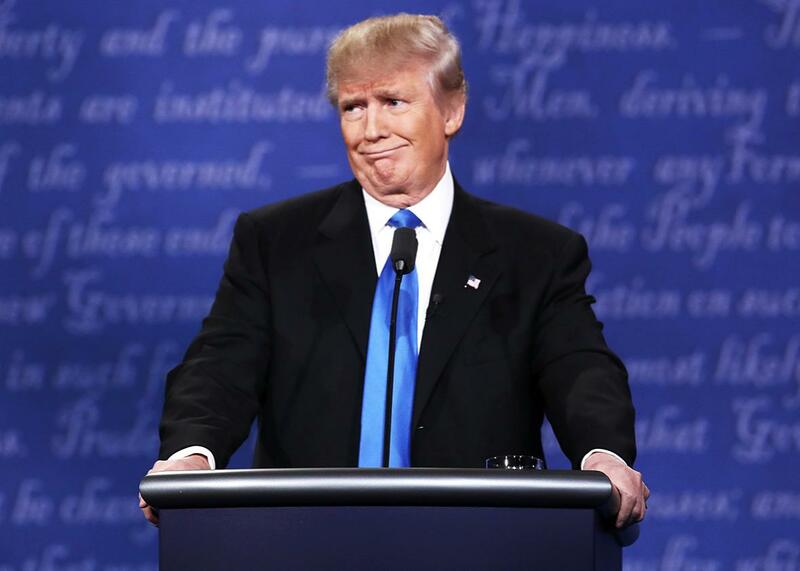 Donald Trump, perhaps thinking about climate change, during the presidential debate on Sept. 26 in Hempstead, New York. And on Jan. 20, Trump will become the only world leader who openly and outright rejects fighting climate change. A July report by the Sierra Club found that the leaders of the 195 independent states of the world all acknowledge climate science and the need for action. The study concludes that “if elected, Donald Trump would be the only world leader today to deny the science of climate change. In fact, a review of the data indicates that Trump might very well be the only world leader not calling for urgent climate action.” Well, now that has come to fruition. Even North Korea has signed the Paris climate accords and pledged to launch a nationwide tree-planting initiative to reduce greenhouse gas emission. And Russian President Vladimir Putin, who may or may not be friends with Trump, released a press statement in November 2015 after the Paris accords that acknowledged global warming’s existence—and, more importantly, humanity’s role in it: “One of these problems is certainly that of limiting organic emissions and keeping global warming within an increase to two degrees Celsius. I think this is a realistic plan and we are prepared to work on this together with our partners.” Russia has signed but not ratified the Paris deal. We found that, while climate change does exist, it is cyclical, and the anthropogenic role is very limited. … It became clear that the climate is a complicated system and that, so far, the evidence presented for the need to “fight” global warming was rather unfounded. The report also said that during a trip to the Arctic in 2010, Putin acknowledged that the climate was changing but cast doubt over the extent to which human activity was a cause. Rodrigo Duterte, who was elected president of the Philippines in May, initially called the Paris deal “stupid,” “crazy,” and “absurd” and refused to sign it, but he backtracked earlier this month to say that the Philippines would ratify the Paris Agreement. “After so much debate, the climate change (agreement), I will sign it because it was a unanimous vote except for one or two (in cabinet),” Duterte told reporters, according to an Agence France-Presse report. Given his history of contradictory statements, it is impossible to know exactly what Trump believe at any given time, but whether he believes that climate change is a hoax or just natural shifts, his statements and threat to withdraw from the Paris accords put him behind on an issue on which some of the world’s most brutal dictators have called for action. A New York Times analysis of a 2014 report from British market research firm Ipsos Mori that studied 16,000 people in 20 countries found the United States had more climate change deniers than any other county surveyed, including Russia and China. If Trump follows through with his appointment of climate change skeptic and coal lobbyist Myron Ebell to head the EPA, those attitudes will be unlikely to change. But who knows? Putin once expressed skepticism about anthropogenic climate change, too, and he seems to have changed his mind. Maybe Putin could actually be a good influence for Trump here.